Magnetic Billiards: Blueprint [Free] is an odd game. The Pickford Bros. might have put a bit too much of themselves into it — they literally pop up all over loading screens offering tips and kudos. A player piano score runs in the menus, and a robotic voice congratulates you on cool shots while doorbells count off combos. Oh, and there’s a back story about how this is all built off a game blueprint found in old family documents. So yeah, it’s strange. But it’s also smart, generous with its free content, and, more importantly, insanely fun. As the name suggests, it’s little bit like billiards. You line up a shot, hit one ball into some other balls, and clear the table to win. There are also an awful lot of elements that bring in a bit of a match-3 flavor. But then the game tosses both inspirations right out the window. The board lacks pockets, and you can only clear the balls by matching all of one color together. If you try to do that as efficiently as possible (as in billiards, or any matching game) and you’ll be rated terribly. You can only earn a good rating by taking as many shots as possible without screwing up. It all feels like it’s been put together backwards, but you’ll get the hang of it. Your score is the product of a crazy amount of factors. Each ball you shoot needs to hit another ball of the same color, or you’ll lose a life. If you do it right, your tariff goes up. Your tariff is the foundation of your score – the points you get for a hit are based off your tariff, any combos you earn multiply it and so on. Screw up and hit the wrong colored ball first, and your tariff gets wiped. You multiply your tariff each time you bounce your ball off a wall on the way to its destination. Buzzing close to a ball of another color multiplies it as well. When you clear a color, the game checks if your linked up balls match a list of cluster shapes, and those reward tariff bonuses, combo bonuses and extra lives. It sounds super complicated, but it doesn’t take long to pick up the salient points. It’s such a cliché, but this game really is easy to pick up and hard to master. Magnetic Billiards’ free-to-play model is pretty much perfect. You’re given the first 20 levels of Classic mode, the puzzles described above. Most levels are locked to start, and you can earn keys to open new ones by doing well. Since the speed you earn keys ties to how successfully you complete each level, you don’t really have to grind — you just need to improve. I played around for well over an hour before diving into paid content. Once you’re ready to move on, you’ll find a few IAP options. You can download the second tier of classic levels and each arcade mode individually, or you can buy all the game’s content (and all future content) for one flat price. The latter option also includes a reusable skeleton key, so you no longer need to worry about grinding your way to new keys if you don’t want to. I’d definitely recommend picking up the premium classic levels. They ramp up the challenge considerably, adding more balls and more colors to deal with. Whether or not you’ll want the rest of the content depends on how much you love to chase high scores. 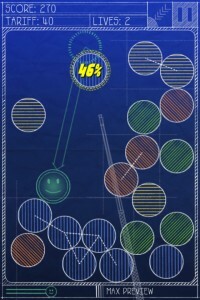 The Arcade levels are interesting, and they change up the game’s formula. Relentless is probably the best of the three, functioning as a slow and steady survival mode that will let you build up ridiculously high tariffs. In Countdown mode, your tariff drops faster and faster, and you have to keep moving to keep it from falling to naught. Sardines packs four new balls onto the field with each move you make, so all your attention will be on eking out a little space to play with. The only thing the arcade modes are missing is the cluster shape bonuses, which would add a nice level of strategy. Still, they’re a solid addition if you’re already hooked. Game Center achievements and leaderboards are available whether or not you choose to pay, and you can get quite a lot of mileage out of the free game. There’s a bit of a learning curve, but you can pick up some great tips in our discussion thread. It won’t be easy to resist unlocking the rest of the content, though. Magnetic Billiards is a creative, original game from veteran developers. It looks great and plays beautifully. That it’s also risk-free is purely a bonus, but it does mean you really have no reason not to take a shot.